• The manager who didn’t have a napkin at his place setting. Instead of asking for a napkin, he tucked the tablecloth into his pants. You guessed it – when he left the table, he pulled the cloth, and the dishes, off the table. • The new associate who went out to dinner with her boss and a prospective client. At the table, she took her gum out of her mouth and put it underneath her dinner plate. She was no longer asked to attend dinner meetings. 1. Understand the purpose of a business meal. 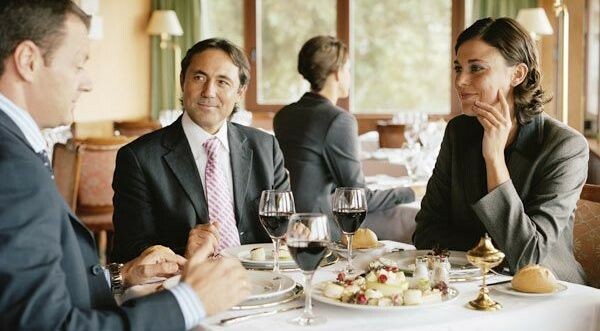 Remember that dining out with customers, clients, bosses, or prospective employers is a business-social activity. You may need to eat, but you are not there for the food. You are there for business. 2. Don’t be late. Plan to arrive a little early. Greet your host and shake hands correctly. 3. Don’t order messy meals. This includes spaghetti, lobster, and French onion soup. My mantra is: Order what you know how to eat, what you like to eat, and what is easy to eat. A business meal is not the time to experiment with new, unusual dishes. 4. Check the menu ahead of time, if you have dietary restrictions. Many restaurants list their menus on their websites. If you are concerned about the ingredients in a particular dish, call the restaurant and ask how that food is prepared. You’ll appear finicky if you spend a lot of time at the table trying to decide what to order. 5. Order something in the mid-price range. If you order the most expensive item on the menu, you look like you are taking advantage of your host. If your host makes recommendations, you can order any of those items. 6. Practice good table manners. Hold your knife and fork correctly. Understand place settings. Have good posture at the table. Do not talk with your mouth full, and do not use the napkin as a Kleenex. And no grooming at the table – excuse yourself and go to the rest room. 7. Engage in conversation. Your host did not invite you just to see if you slurp your soup. It’s an opportunity for that person to get to know you. Are you someone he or she will be comfortable working with? Are you an upbeat person? Are you self-assured, with social graces? Finding areas of common interest can help establish rapport. Are you both into playing golf, traveling, or watching your kids play soccer? 8. Don’t drink too much. You don’t have to drink, but you may want to enjoy a glass of wine during dinner when you are at a nice restaurant with your host. Stay sober. 9. Understand the bill-paying process. It is the host’s responsibility to handle the check. As a guest, do not offer to split the bill or pay the tip. Make sure you thank your host at the table, and then later send a thank-you note. 10. Follow up with any promises you have made. You illustrate your reliability when you do. Additional information on business dining can be found in my previous blog, Don’t Take Your Neighbor’s Bread and Other Dining Suggestions, and my latest etiquette book, The Essentials of Business Etiquette: How to Greet, Eat, and Tweet Your Way to Success. Pachter & Associates provides seminars and coaching on business dining. For additional information, please contact Joyce Hoff at joyce@pachter.com or 856..751.6141.
discipleship program The C.S. Lewis Institute was founded in 1976 and endeavors, in the legacy of C.S. Lewis, to develop disciples who will articulate, defend and live their faith in Christ in personal and public life.